Satisfying the munchies just got a bit easier for students at the University of the Pacific in Stockton, CA. Just arriving on campus is a robotic, snack-wielding, six wheeled, self-driving bot that is well-stocked with snacks and beverages and standing at the ready to deliver orders from any of the 5,000 students. Called snackbot, the robot is designed for the outdoors, using a camera and headlights to make its way through darkness and rain. 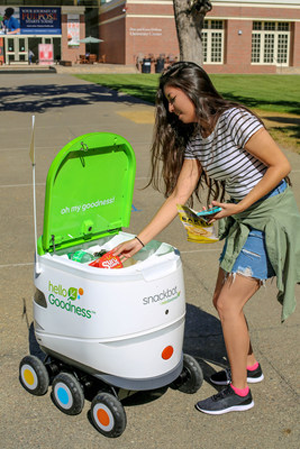 All-wheel drive capabilities handle curbs and steep hills as it delivers snacks from Hello Goodness, a curated portfolio of better-for-you brands from PepsiCo, to designated locations around campus. Students can order food and drinks from 9 a.m. to 5 p.m. via the snackbot App to be delivered to more than 50 designated areas across the 175-acre campus. The bright green and white bots are stocked with a variety of items, including Smartfood Delight, Baked Lay’s, SunChips, Pure Leaf Tea, bubly, LIFEWTR and Starbucks Cold Brew and have a range of more than 20 miles on a single charge. The ordering app is available for iOS and to those with a University of the Pacific email address. Snackbots were developed in partnership with Robby Technologies and are the first robots from a major food and beverage company in the U.S. to roll out, PepsiCo said. 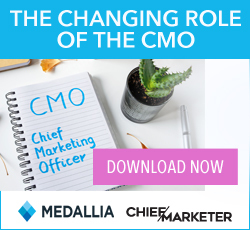 Building on the initial successes of its Hello Goodness vending platform, PepsiCo has expanded the idea of curated convenience into new formats, locations and experiences to deliver 50,000 touchpoints by the end of the year. Snackbot is part of this effort.